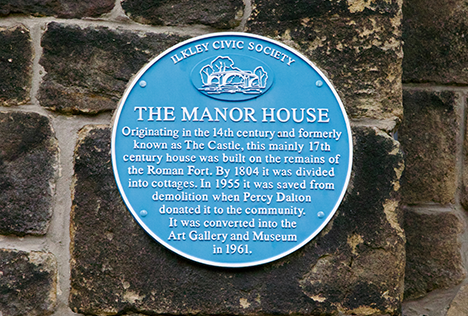 The Ilkley Manor House is a precious historic asset in its own right, built as it is within the footprint of a Roman Fort – it’s highly unusual to have a Grade 1 listed building on top of an ancient monument. The presence of the historic All Saints Church next door suggests that Ilkley’s civil and religious masters in the early Middle Ages were capitalising on the prestige of Ancient Rome by building on the same ancient site. The earliest parts of the house itself date back to the mid-14th century. 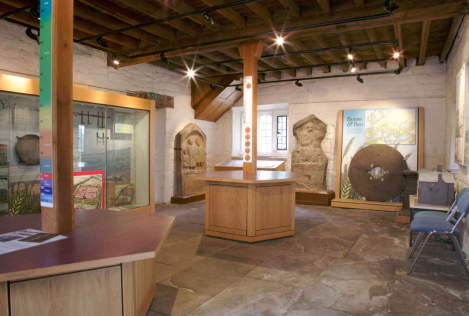 It’s one of the oldest surviving buildings in West Yorkshire and, unlike most of its rivals, its central great hall (c. 1340, known as ‘Period I’ in the building’s history) was built of stone, not timber – probably due to the handy source of Roman material to work with. Several features of its design, including the now absent minstrels’ gallery in the hall that’s indicated by the otherwise inexplicable first-floor doorway, add to its rarity and distinction. In about 1550-60 (‘Period II’), the hall was rebuilt to create a ground-floor room with a bedroom above and the wing closest to the church was constructed in its present form. The rounded bay or ‘oriel’ window, rising through two floors and lighting both of them, and the built-in latrine to the new wing, was remarkable in houses of this scale and date. The rebuilding of the western wing in the 17th century (Period III) then created the building much as it stands today. In summary, thanks to its excellent preservation and the clear distinction between its three main building periods, the Manor House is a text-book illustration of how English houses developed between the Middle Ages and the ‘early modern’ period. Ilkley is considered by historians most fortunate to have such a gem in its midst. Imagined reconstruction showing the Manor House as it might have looked when first built in about 1340 (Period I), when the great hall – with the tall windows at the centre – occupied the full height of the building and was heated by an open fire in the centre of the floor. You can also see here how it might have looked from about 1550 and then after about 1650 – much as it is today.